Disputes happen. And, when they do, it sometimes takes a neutral body to resolve the issue. That’s where mediators are valuable mediators. While they don’t always end disputes, they can sometimes shed more light on the issue and make a resolution come more clearly into sight. Or they can’t, and then it goes in front of a judge. Find out more about mediation and how to become a mediator by reading on. Mediation, in the criminal justice career field, is a form of Alternative Dispute Resolution. It’s a neutral third-party negotiation sought out to help facilitate an agreement between disputing parties. Mediation is voluntary, and once the mediation papers are signed, the decisions are legally binding. It is a six-part process that includes an introductory remark, a statement of issues from the involved parties, information gathering, bargaining, and ideally, agreement reaching. Mediation doesn't require lawyers, only mediators, and the dueling parties. Depending on the issue, hiring a lawyer may not be a bad idea because they can help answer questions and offer advice. Most mediations only last a day or two. However, depending on the complexity of the problem, the mediation could go on longer. It is a quicker and cheaper process than litigation, which could last months and cost thousands in fees. There are many reasons to use mediation, such as divorce, consumer disputes, neighborhood issues, contractual disputes, and more. If parties are unable to come to an agreement, court is usually the next course of action. Either way, both sides generally share the cost of the mediation. Conflict mediators are usually employed by law offices, corporations, the government, and political organizations. It is the responsibility of the mediator is to remain neutral to help both parties reach a mutual and amicable decision. A mediator does not make decisions; instead, they provide direction through conversation and collaboration with the clients. Not everyone is cut out for mediating. A person has to possess certain key traits and qualities to do the work fairly and efficiently, even aside from being able to remain neutral during a mediation. 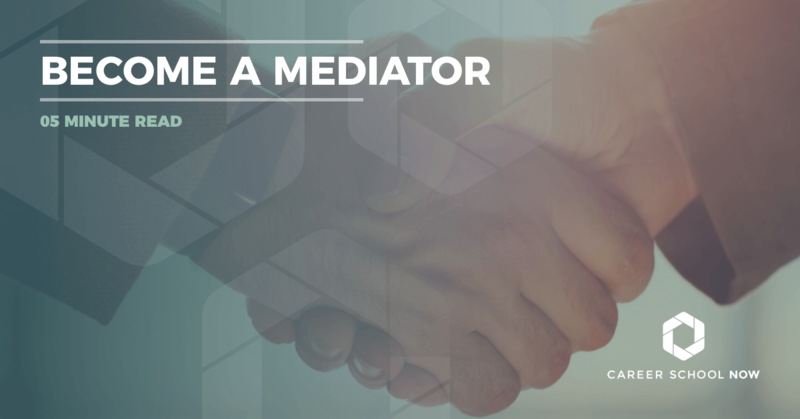 Being a good mediator is far more than just taking the mediator certification course. Emotional intelligence: To be suitable for the job, you must be able to understand emotions and where they are coming from in relation to the issue at hand. Active listener: Much of the time you’ll spend, you’ll be listening to both sides of the story. You need not only to hear but fully understand what the conflict is about. Active listening is hearing with all your senses and actively participating in the conversation, even if it’s just a nod of your head to validate that the person has been heard and understood. Effective questioning: To truly get a grasp on the issue at hand, you need to be able to ask meaningful, and profound questions. Asking questions keeps you in control of the conversation while gathering information. Empathy: Many conflict mediators deal with are highly emotional in nature. Being able to put yourself in someone else’s shoes can help navigate the dispute toward a peaceful resolution. Critical thinking: You need the skills to actively process the information gathered from both sides of the struggle while remaining neutral. Interpersonal skills: You’ll be meeting with a variety of different personalities. So, not only do you have to stay calm and collected, but you also need to be able to assist in moving the conversation forward. There are degrees, from an associate’s through a doctorate, available in conflict resolution. However, a degree is not necessary to work as a mediator. With that being said, most mediators have, at minimum, a bachelor’s degree. Often, mediators are retired judges, lawyers, or business professionals who are qualified to work as a mediator. While there are no exact state requirements for training, some require the completion of a 20-40 hour course. Some states also require mediators to work under the supervision of more experienced people for a certain number of cases. There are no licensing requirements. However, each state takes a different stance when it comes to certification for their mediators. Licensing may have to be appropriate to the mediator's area of expertise, such as licensed attorneys or CPAs. Mediation courses and training are available online and through different organizations. Conflict resolution, or alternate dispute resolution, is a process to fairly and neutrally settle disputes. The alternate dispute resolution can be applied to a variety of careers and occupations. Salaries are relatively similar for all conflict resolution professionals, as are any requirements. Arbitrator: An arbitrator is hired as a third-party to hear and settle disputes. They may work alone or with a panel of other arbitrators. Arbitrators are allowed to impose decisions on the conflicting parties. Conciliator: Most similar to mediators, conciliators help guide the opposing parties toward a settlement agreement. Usually, they’ll meet each separately. Unlike mediators, the conciliator does not write or make decisions, nor do they have authority to gather evidence or call witnesses. Ombudsman: A middleman hired by a group of people who comes in to investigate disputes and make recommendations on how to best resolve them by using Alternate Dispute Resolution techniques. The Bureau of Labor Statistics website reports the median annual salary for mediators to be over $60K. On the lower side, 10 percent are earning $35K while the top 10 percent are earning well over $124K. Many mediators work part time and use it to subsidize their primary occupation income. The predicted job growth through 2026 is 11 percent. However, because mediation is such a small industry, it will only open up about 900 jobs. People with law degrees will have better job prospects. Specialized lawyers will have even better opportunities.